Asa Kie Khaiba Ho Ama Raja Babu Ghara Khana is a popular Odia song, which takes us on a foodie journey to various places in Odisha and the popular food associated with it. The song featured in Odia movie Akhi Trutiya (1980) and picturised on comedian Shyamalendu & Namrata Das, beautifully rendered in his trademark style by Tansen Singh with lyrics by Baikuntha Nath Mohanty and music by Rakhal Mohanty. 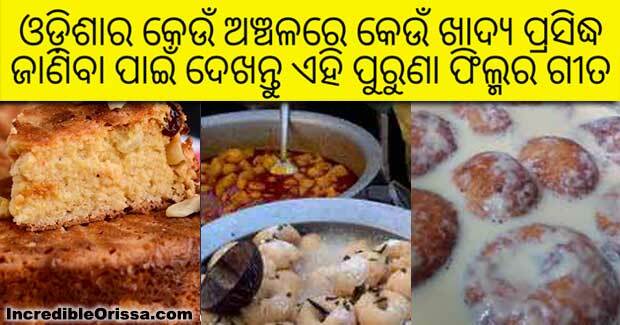 Famous foods of Odisha which are described in this song are – Rasabali (Kendrapara), Khirmohan (Salepur), Kora Khai (Bhubaneswar), Mudhi (Baripada), Gaja (Balasore), Palua Ladu (Bhadrak), Chhena Poda (Nayagarh), Biri Bara (Dhenkanal), Dahi Bara (Cuttack) and other foods. Some feel that certain items and places have not been featured here like Pahala Rasagola & Nimapara Chhenajhili. The reason is that very few know that this iconic song has been inspired from another rare song of 1930s whereas Pahala Rasagola and its market came up only in 1950s, still the lyricist could have added Pahala Rasagola name in the version song while customising the contents as per current trends. The old song rendered by Gokul Mohanty in the prevailing South Odishan style, features the popular Odia food and the places associated with it in Odisha at that period. I feel this type of songs can be used for promoting food tourism and thereby promoting Odisha tourism.